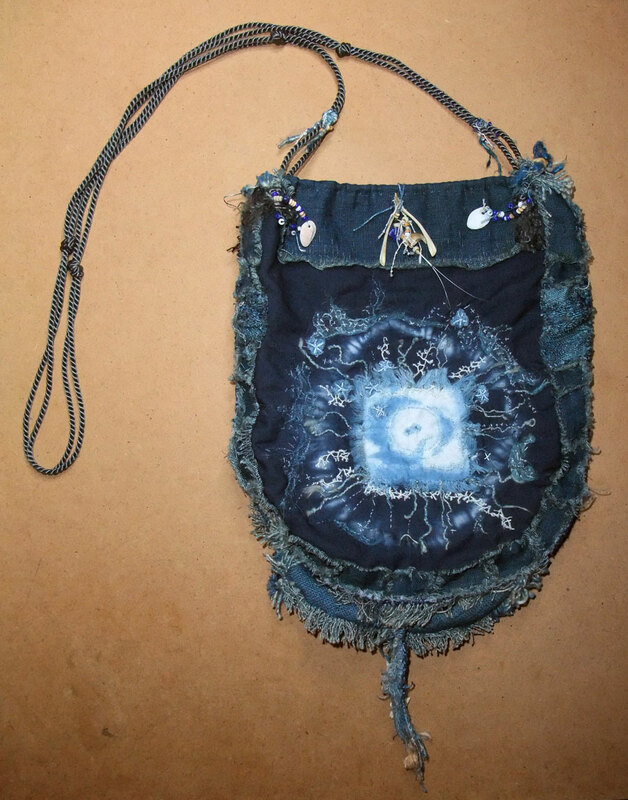 the blue moon talinistic dilly bag is related, I sent it up to Eric & Carol the day before Carol died because she wanted to smell the myrrh beads but it arrived too late… it will make a good place for Eric to keep all the sympathy cards. This one is more like the bag I had in mind back in January & came together fast! I think this is beautiful Mo….a real testament to Carol……..that bright light in the Indigo sky. Thank you Eliene, I love how her spirit shines so much it evaporated the tears! thanks for the good words Carol! the funeral begins in half an hour Eric will be playing his beautiful Windows CD 3 thousand miles away in Far North Queensland, we will listen here at home, holding space for her bright brave spirit to fly free. (((Margaret))) your Blue Star Woman just went on this bag too but is still being very shy about having her photograph taken! Oh dear, such a lovely honoring of a soul. Blessings. thanks for the good vibes V! This is just beautiful, Mo, an honor to your friend and a way to sit with the grief for awhile. thanks for visiting Christi, “there is comfort in melancholy” to quote Joni Mitchell from her Hejira album. I will take it out this afternoon to look at some art, it’s the perfect size for my water bottle and glasses. Just beautiful, what a wonderful tribute. (((Debbie))) she was such a bright spark! I hope you had a peaceful day thinking of your friend, Mo. Your memory keeper is such a beautiful way to remember her. A bag of beauty filled with tears and memories: Mo as you use this bag, Carol is right beside you. 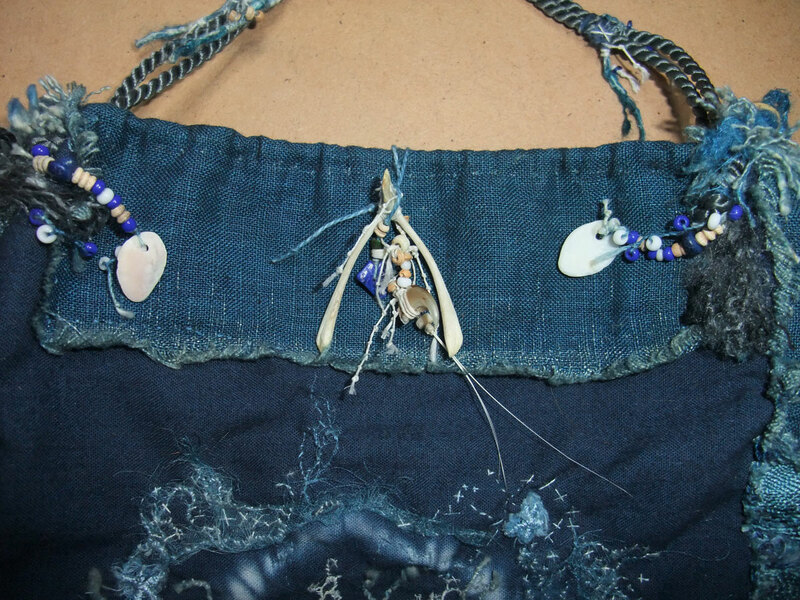 She is always with you in your heart but this beautiful homage to her via this cloth bag, indigo sky, talismans of love, threads of connection, keeps her by your side, spirit walking in step with you. A night will come when the moon is especially bright and beautiful, go outside, walk barefoot in the grass or dirt or sand, lift the bag up to face the moon, it will be blessed anew because love of dear friends is always with us, and we are blessed for having it..
(((Marti))) that’s a perfect ritual for this little bag! This is so beautiful Mo. Keeping memories is really what it is all about isn’t it. A special place to keep memories of your friend and of course the therapy of stitch. Much love to you. Healing stitches when your eyes are full of tears…………. Oh yes i know how you’re feeling. You made a wonderful memory keeper for your friend……. 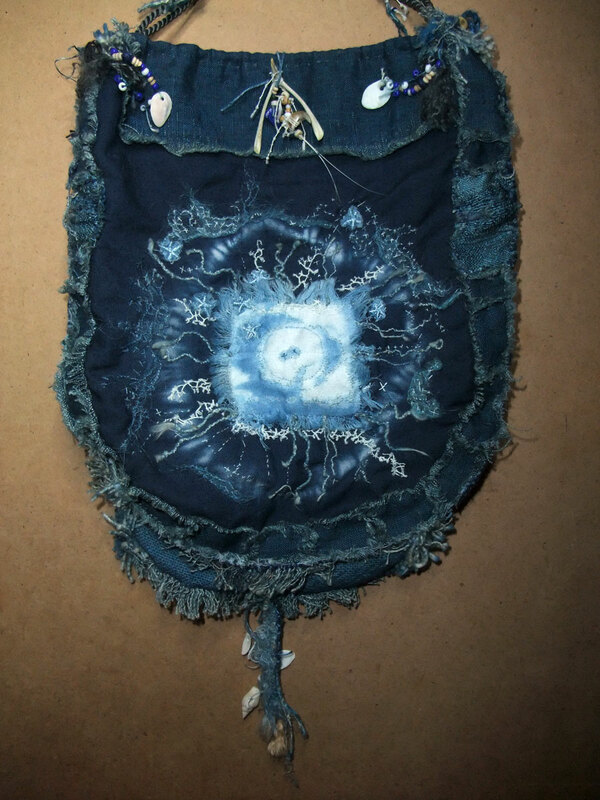 Oh (((Martine))) you beautiful moon stitching sister!! (((Margaret))) I am so happy she finally allowed me to photograph her! (((Sharmon))) this is some journey! 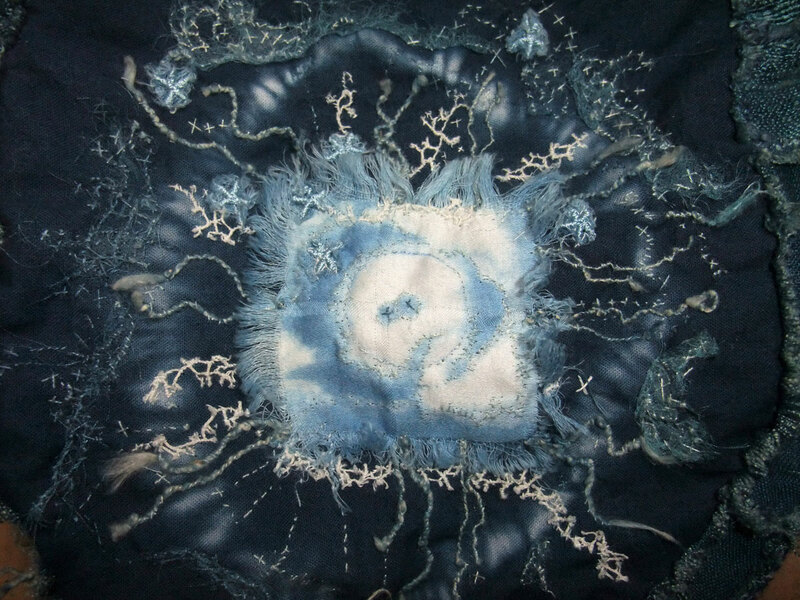 it was your button moon, vintage indigo cloths & sturdy thread that made it all come together & fast! how intense and gentle a creation. hope the tears have rinsed some of the grief away. eek! mortuary beetles as a literal metaphor… ?